SAEOPP & KAEOPP membership dues are currently due for 2010-2011. Membership in both organizations provides many benefits. These include discounted conference rates, voting rights, publications from each organization, scholarship recommendations for your students and much much more. In order to get the member rate for the KAEOPP/TASP Fall Conference, your membership dues must be submitted prior to registering for the conference. KAEOPP Membership is considered late after September 30, 2010. SAEOPP Membership is considered late after October 31, 2010. In order to be a member of SAEOPP, you must first be a member of KAEOPP. KAEOPP membership is $30 for the year, and SAEOPP membership is $50 for the year. For more information about KAEOPP membership, visit our KAEOPP Membership page. 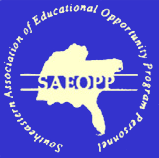 For more information about SAEOPP membership, visit the SAEOPP Membership Information page.